The official FIFA World Cup song is ringing out of the speakers, the ceiling is bedecked with the flags of all 32 competing nations and alongside there is a poster with information on score-line predictions for the first of the two semi-finals, between Belgium and France. 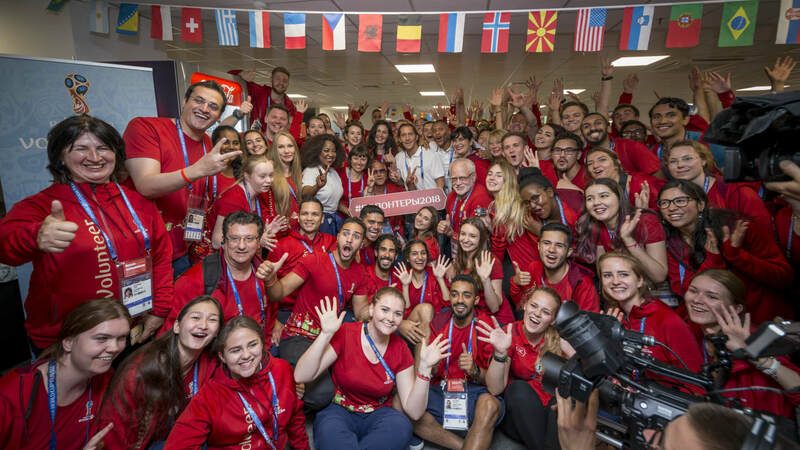 The Volunteer Centre at the Luzhniki Stadium in Moscow is a happy, welcoming place full of laughter, impromptu dancing and table tennis matches - and on Media Day, it even has VIP guests. FIFA Secretary General Fatma Samoura, along with FIFA legends Michel Salgado and Julio Baptista, came to visit the helpers and express their enormous gratitude for all that they have been doing. "You are the heart and soul of this World Cup. You are the ones who have enabled this tournament to become a reality," the General Secretary said, to thunderous applause from all present. 17,040 volunteers are working at the FIFA World Cup all across Russia in 20 different capacities. They were selected from a record number of candidates - no fewer than 176,870 in total! The volunteers come from a variety of different backgrounds and include the captain of an oil tanker, a former footballer and even a world champion dragon boat racer. What unites them is a love of football and the willingness to show a real sense of commitment over a number of weeks. Thirty-six per cent of volunteers are men, 64 per cent women. They include a grandmother and her grandson, couples and indeed entire families. 93 per cent of them come from Russia while seven per cent came specially from 112 different countries just to take part. One such person is Hiba from Morocco. "It is an incredible experience to be part of this tournament and to come into contact with people from all around the world," she says with a huge smile on her face. "We're one big family." It is a family that Samoura, Salgado and Baptista were delighted to spend some time with, playing table football with the volunteers, listening to excited stories of the tournament to date and even showcasing their dancing skills during a flash mob. "The assistance of the volunteers is amazing, the energy they have," said Baptista. "The World Cup is not the same without them. This is the best I have ever seen and that's thanks to them as well." "We want to say thank you to you all for your friendliness and your smiles," Salgado added. "You are the ones who have made the most successful event in the world - the FIFA World Cup - into something so special."